View More In Swings, Jumpers & Bouncers. 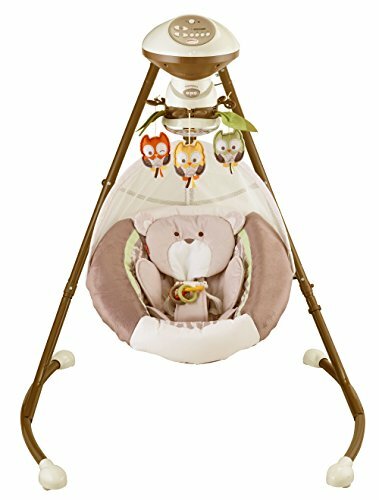 Get the soothing motion babies love—and the break your arms need!—with the Fisher-Price Auto Rock 'n Play Sleeper. Now babies can soothe and snooze in comfort while the inclined sleeper gently rocks on its own all night long! There are separate settings for naptime and nighttime, two auto-rock speeds, and 12 soothing songs and nature sounds, so you can find the perfect calming combo for your little one. And it folds easily, so you can stow it or take it on the go at the press of a button! (You're welcome.) Where development comes into play Sensory: A variety of soft textures, soothing music, and rocking motion stimulate baby's senses. Security & Happiness: Soft padding, soothing music, and gentle rocking help calm baby and become part of the nap and bedtime routine, giving baby a sense of security. For issues, please call Fisher-Price Customer Service: 800-432-5437. Machine-washable seat cover with deluxe Snugabear body insert and head support.